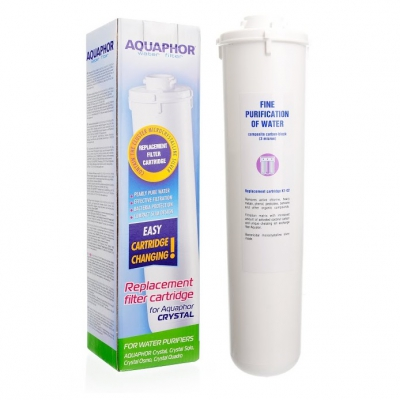 Modern, compact filters Aquaphor Crystal series not only perfectly and quickly purify water, but also thanks to using innovative technologies are the most convenient and easiest to use of the other desktop filters. Replacement filters last much longer than normal systems due to the increased amount of adsorbent. Crystal also outperforms other brands because it is much easier to replace filters due to the special fasteners which require minimal time and effort. In addition, filters are replaced with housing that prevents contamination. Aquaphor Crystal - a stylish and ergonomic "slim" design which provides fast access to high-quality drinking water. 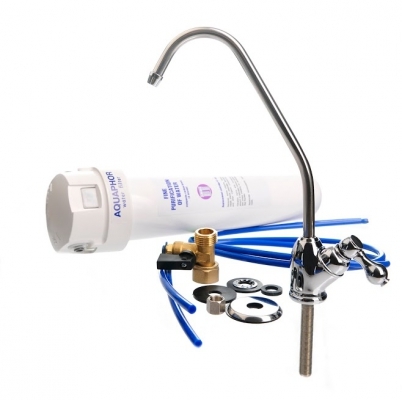 It comes with a high quality separate tap that can be rotated 360 degrees. Its ceramic valve provides for a long lifespan. Replacement filters last much longer than normal systems due to the increased amount of adsorbent. The Crystal also outperforms other brands because it is much easier to replace filters due to the special fasteners which require minimal time and effort. In addition, filters are replaced with housing that prevents contamination. 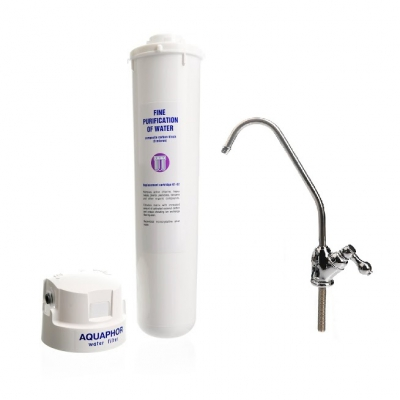 It takes up minimal space and safely cleans water of any chlorine, organic compounds and other impurities. It is recyclable, makes use of an environmentally friendly production process, and is made of heavy-duty plastic. This is a one-stage water filtration system which offers high quality water filtration using the latest activated carbon block technology. This system uses a composite carbon block filtration matrixes which includes a pore size of 0.8 micron and has an increased amount of activated coconut carbon which will safely remove chlorine and any other unwanted chemicals, bacteria, lead and other harmful heavy metals, phenol, pesticides, benzene, volatile organic compounds, insecticides, pesticides, industrial solvents and many other common impurities. This system offers substantial filtering performance for its size and will greatly enhance the quality of your drinking water.